Kenny J: The Age of Ultron is upon us and very shortly I will be seeing the movie of the same name. As is so often the case with these big bucks movie franchises, the tie-in marketing machine sprung into life over a year ago, but Ultron has been an integral part of the Avengers’ history for much longer. Sure, Earth’s Mightiest Heroes have far greater and fiercer foes but there are few that are so entwined with them on a personal level. That’s what makes the silver A.I. such a shoe in for the enemy-du-jour in the Avengers’ latest big screen outing. He is the villain that will most likely push the MCU into its darker third phase with his origin easily adaptable into Tony Stark’s not-so-futuristic experiments. It’s not just his beginnings that remain easily malleable though. As you’ll see from this selection of covers, Ultron likes to keep his appearance pretty fluid, making him one of the Avengers’ most durable and enduring enemies. This cover, as drawn by John Romita Snr, is full of drama. 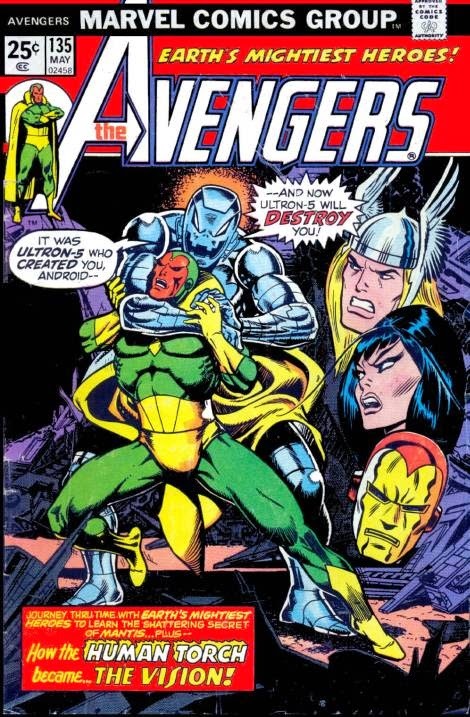 From Ultron strangling his android son, The Vision, to the disembodied heads on the right, it's pretty by the book in terms of telling you what exactly is going to happen inside the pages but it’s done with such flair it entices the reader in rather than spoiling the outcome of the story. This is a skill that is sometimes amiss nowadays with covers going for showiness over practicality and doing their job. That’s what turns a browser into a reader! In an almost defiant act of early ‘90s revivalism, this issue sports a shiny foil cover. There are several better covers in this series - I even think the perspective is way off - but I wanted to include it just for the sheer joy it brought me when I laid my hands on it. 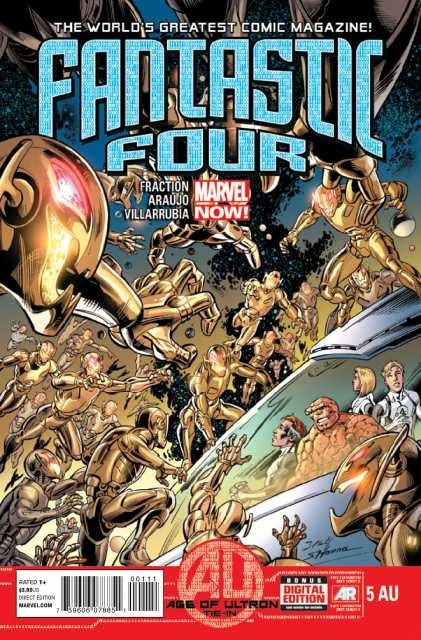 I guess the gold foil effect enhances the reflection of Hawkeye taking aim at Ultron but this cover really has no excuse for existing apart for just being plain fun, even if its sparkle is lost on a computer screen. All the publicity for Avengers: Age Of Ultron points towards Tony Stark having a very large role in the creation of the titular character, so could we be seeing something like this cover by Keron Grant in Marvel Studios’ tentpole outing. 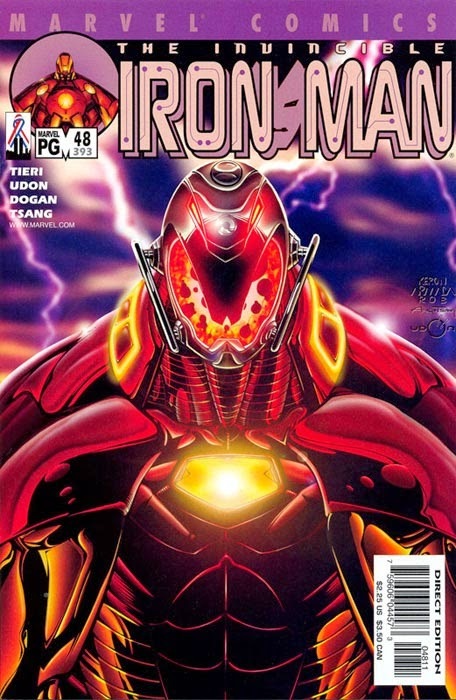 Popping with ‘90s style, it depicts an Iron Man twisted into an oversized version of Ultron. 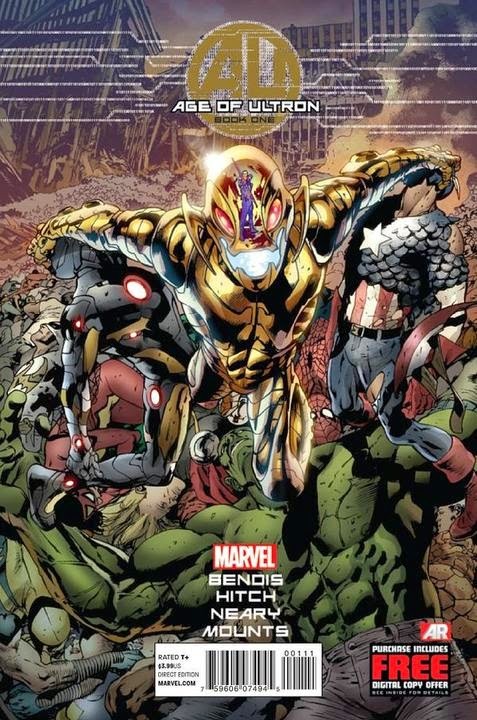 You don’t even need to open the comic to know that an Ultron equipped with repulsor technology isn’t a good thing. What's more deadly than an Ultron? 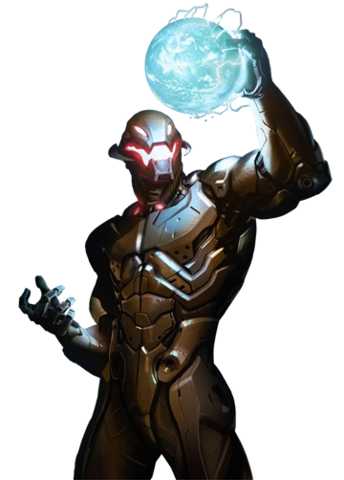 Hundreds of Ultrons, as the Marvel Universe's First Family find out while taking a trip into the crossover event, Age Of Ultron. Mark Bagley's cover is full of detail giving each Ultron clone as much personality as the Fantastic Four trapped in bottom right corner. Well, as much personality as you can give a vicious murdering automaton intent on killing everything! Sometimes it’s those obvious ideas that take nearly forty years to come to fruition but when they do it can be beautifully simplistic. Okay, the Phalanx didn’t actually make their Marvel debut until 1994, but it seems the cybernetic villainous aliens and the Marvel Universe’s chief cybernetic being were a match made in cosmic heaven. 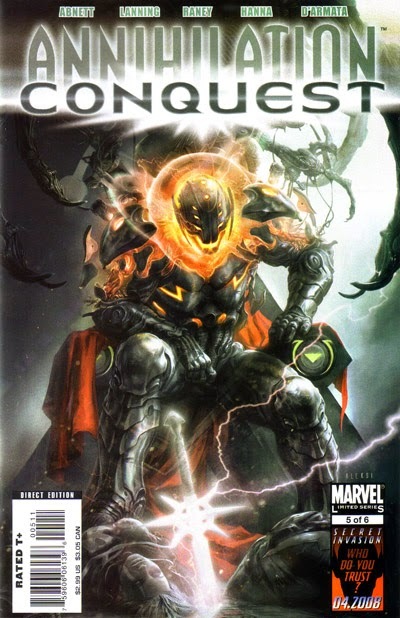 This spectacular cover by Aleksi Briclot shows Ultron in his rightful place as king of the Phalanx complete with their trademark rows of evil eyes. I’ve included this for two reasons. Ultron may have made his first appearance thirteen issues before this one but this is the first time he appeared on the front of any comic. It also set the blueprint for many of his future exterior turns. The way he is drawn here, as a giant vanquishing the Avengers with ease using a bit of Kirby Krackle, is the same way he would be shown on most covers up until the present day. 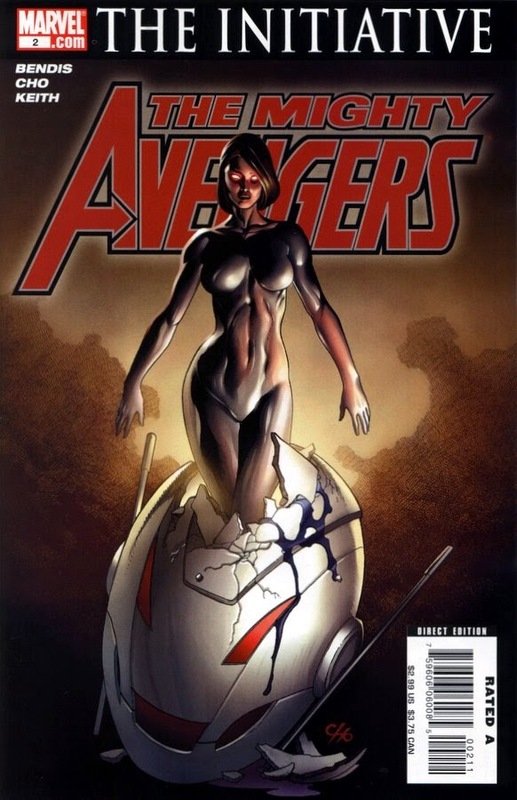 Here at The PCG we’ve been running a series of articles about the first Avengers comic we ever read. Rather embarrassingly, the first issue of this series written by Jeph Loeb may have been my first! 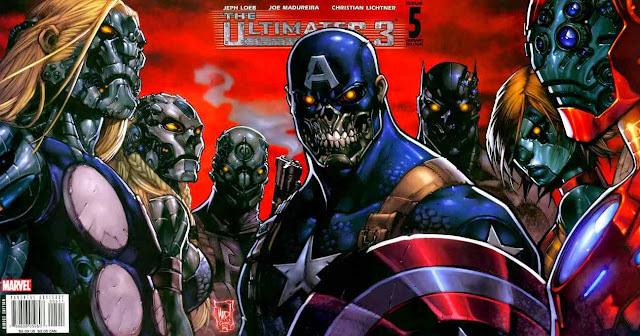 Sure, I had read many comics featuring the separate adventures of the 616 heroes but it was the lure of Joe Madureira’s art that finally brought me to read an Avengers comic, albeit one set in the Ultimate Universe. His oversized, over-the-top style, as seen in the now classic Onslaught Saga, was the first I was exposed to when I initially started reading US comics. This final issue variant depicts the Ultimates as if they were clones of Ultron - a bit spoilery but undoubtably a cool image. This is one of those times Ultron shows just how cruel and manipulative he can be by taking the form of his creator’s ex-wife, Janet Van Dyne aka the Avengers’ the Wasp. Frank Cho uses the iconography of Ultron being reborn in his new sleeker body from the cracked egg head of her more robotic former self. There is no mistaking that this is evil merely in a different form with those malevolent glowing yellow eyes picked out against the greys and browns of their surroundings. I always love to see how John Romita Jr will render any character and in the previous issue of this title we got his early take on Ultron. However, it’s Daredevil #276 that sports the better cover. With its foggy setting and morose subject matter, JRJR has created an almost Shakespearean tableau. 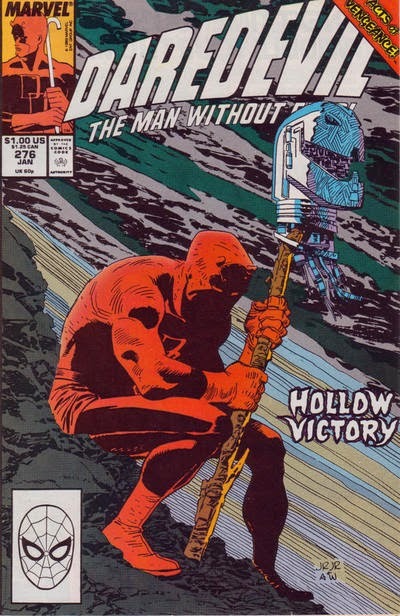 It’s not the most adept portrayal of either character, neither is it Romita’s best, but the image of Ultron’s severed head atop Daredevil’s stick, alone, is a powerful one. Add the words ‘Hollow Victory’ to that and it's an invitation to read. 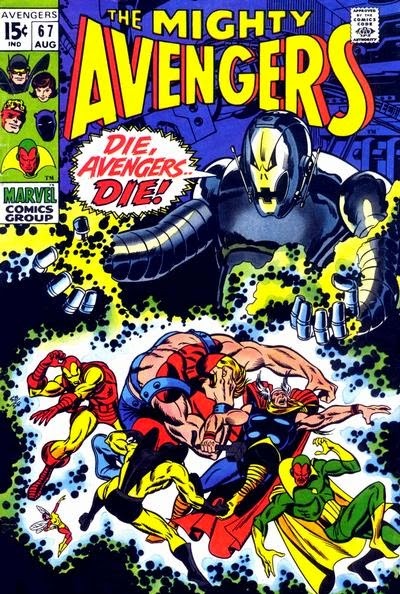 For me, this is probably the most iconic of all covers featuring Ultron. It uses merely the cut-out features of the automaton picked out in red against the otherwise completely black background. With this, George Perez manages to create a minimal effect while keeping a distinctly comic book aesthetic. 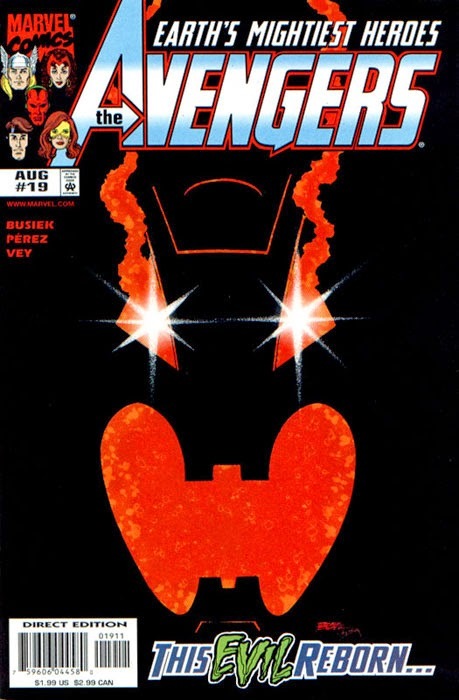 If anyone was uncertain whether the character adorning this cover was friend or foe then those scarlet, smoking eyes will leave them in no doubt. It takes a high level of skill and understanding of what a cover should do to get over all that information across in what is essentially just an image of two colours.